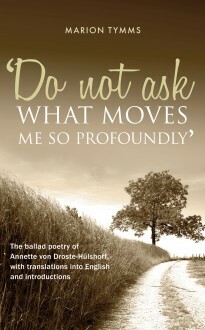 Annette von Droste-Hülshoff’s reputation as one of the great German poets has grown steadily since her death in 1848. An examination of the considerable work she completed during her short life reveals a fascinating mind and an exceptional talent, yet one which defies attempts to define or categorise. This is the third book on Droste-Hulshoff’s work by Marion Tymms, in succession to God’s Sorely-Tested Child (2012) and The Wild Muse (2013) This Volume focuses on her narrative poems, a genre in which Droste-Hülshoff excelled, although this was scarcely recognised during her lifetime. The poems have at their core stories told with drama and passion, and tell of the capacity of the human heart and mind to endure and accept the sharpest pain. The book includes the author’s translations of the works discussed.